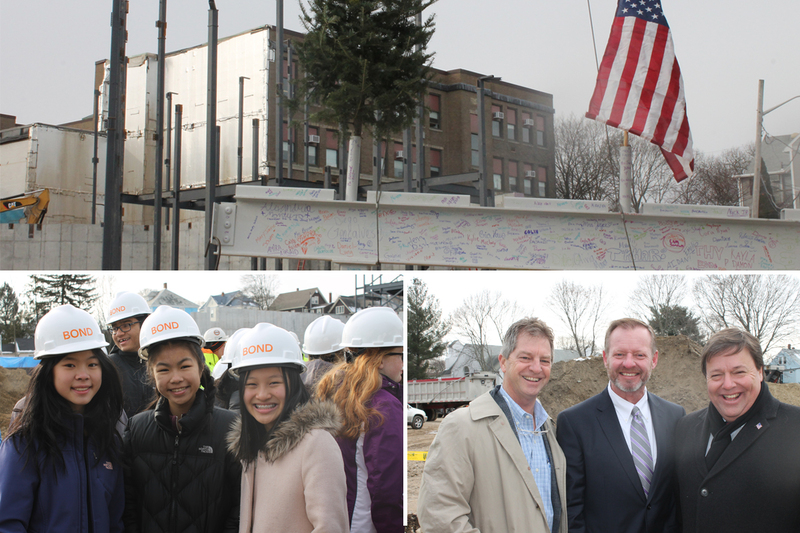 (Boston, MA) – BOND, the Northeast’s premier building, civil, utility and energy construction firm, celebrated the topping off for the new Southwest Quincy Middle School. The ceremony marked the final steel beam set into place on the new 95,000 SF building. It was attended by City of Quincy officials, the School Building Committee, Massachusetts School Building Authority (MSBA), Ai3 Architects, owner’s project manager PCA360 and the BOND project team. The new modernized facility will replace the Sterling Middle School, built in 1927 and provide enhanced educational services for students in grades five through eight. BOND is using Building Information Modeling (BIM) along with 3D phasing and logistics plans that allow students to remain in the existing school while the new facility is being built. BOND is also using Lean management principles to streamline the schedule and provide the best value construction. The new building will be completed by early spring of 2019, with the remainder of the existing building being demolished following the occupancy of the new school.